This new Marine2 design has been developed using KLAW?s 18 years operational experience and over 15,000 marine breakaway couplings in operation. The Marine2 reduces stress and fatigue placed on the hose when wrapped on the reel. This in turn reduces operational costs. The Marine2 protects hose transfer systems used in ship-to-ship and ship-to-shore transfers. In an emergency the coupling would activate shutting down both upstream and downstream flow within the hose transfer system offering 100% shut-off. This coupling therefore reduces risk of spills, damage to assets and possible injury to personnel. 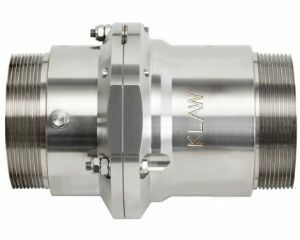 The marine breakaway coupling still uses KLAW?s proven Flip-Flap valve technology and easy reset facility and requires no special tools for servicing. The Marine2 resists the pressures encountered such as bending moments and torsional forces expected from floating wave motions and the rigors of the marine environment. The Marine2 is compatible with hard-walled, soft-walled and composite hoses in normal bore sizes of 2? , 3? , 4? , 5? and 6?, and can accommodate a wide variety of end connections including BSP, NPT and BSP threaded, flange connections and hammer union fittings. For further information on the shortest and lightest marine breakaway coupling on the market click here for full details.